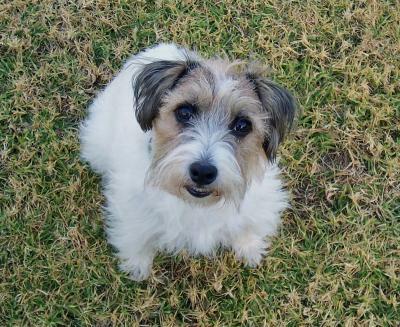 Georgie is an 8 year old JRT who loves living up here in the Blue Mountains, NSW. She is a very friendly and affectionate pup and always goes up to greet people when we're on our daily walks. As we live in a tourist area we get lots of visitors around the place. A few weeks ago a bus load of Japanese visitors stopped and each one had their photo taken with Georgie who was more than happy to comply. She is my best mate and a wonderful companion. Georgie is really cute. Boadie from Petersham is also on this site. I notice that my girl is one of only a very few black and white JRTs. Georgie looks to have a very suitable coat for the Mountains.